Jawbone CEO Hosain Rahman turned a few heads when he unveiled the Jawbone Up at this past year’s TED conference, mostly because it seemed like such a radical departure from the usual Jawbone lineup. When speaking to our very own Sarah Lacy, Rahman promised that the Up would be available “soon,” but we may be getting very close to a release. The health-conscious Up wristband has popped up very briefly in Apple’s online stores and Jawbone’s own website today, which means the official launch can’t be too far off. Here’s a quick refresher for those unfamiliar with the Up: it’s essentially a (rather fetching) wristband with a built-in accelerometer. It’s meant to collect data about everything from how active its user is to how well the user has been sleeping, in hopes that quantifying this information will make users more likely to keep track of it. It’s not the newest concept in the world (the FitBit predates the Up by quite a bit), but it’s one that could stand to benefit from stylish execution. One of our faithful tipsters sent us this screengrab of Apple Italy’s online store (above), which very clearly shows us that the Jawbone Up will be available in three different sizes, and may retail for around €99. A little digging of my own yielded a cached version of Apple’s UK store, which claimed that the Jawbone Up was in stock and ready to ship, provided you were willing to fork over 79 quid. It also seems to confirm that the Up will ship in three different colors, so the chromatically picky shouldn’t trouble finding a hue they like. 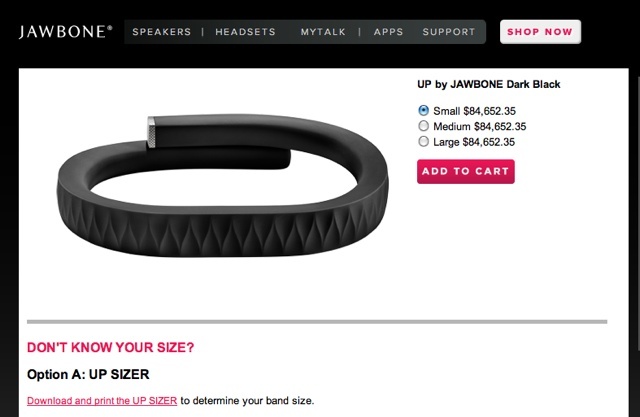 Most damning is that the Up also has its own product listing on Jawbone’s online store, though I wonder how long it will stay up. Someone on Jawbone’s side seems to have caught wise, as the product page first listed a $99 pricetag but displayed an outlandish placeholder amount when refreshed. So, it looks like it shouldn’t be long at all before fitness fiends will be able to pick up a Jawbone Up. Speaking as someone who got into running by tempting himself with gadgets (and hasn’t gotten a good night’s sleep in weeks), I personally can’t wait to get my hands on one. Many thanks to our tipster, Paolo!